this has been circulating on my facebook page and it was just too good not to share. This entry was posted in life and tagged blogging, diet, food, goals, health, journal, life, lifestyle, personal on January 6, 2012 by losing bee. Very interesting comparison! Individuals who eat a diet which consists of mostly fruit, veggies and legumes are overall much healthier compared to people who eat a lot of meat, dairy and sugary desserts. The majority of Americans are eating too much meat, dairy and sugar. It comes down to moderation…but if you google the following women; Kim Basinger, Joan Jett, Shania Twain,Christy Turlington, Naomi Watts and Christie Brinkley…they are all vegetarians, in their 40’s-50’s and very attractive. 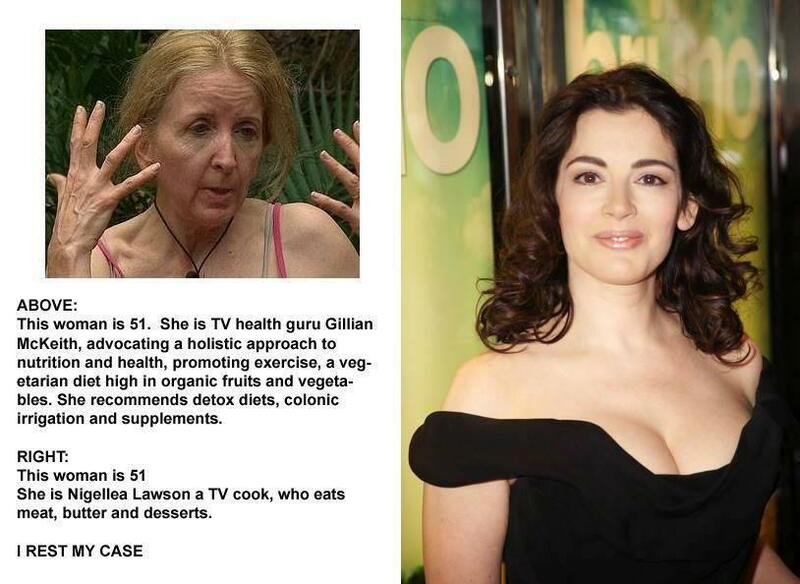 The woman on the right in your photos is physically stunning and more attractive than the other lady but I wonder what her overall health is compared to that of the TV health guru….